Black Souls is a Sopranos-style tale of power struggle and revenge, but with an anthropological, analytical, plodding approach, as opposed to a high-octane, flashily-edited package of drive-by retributions. 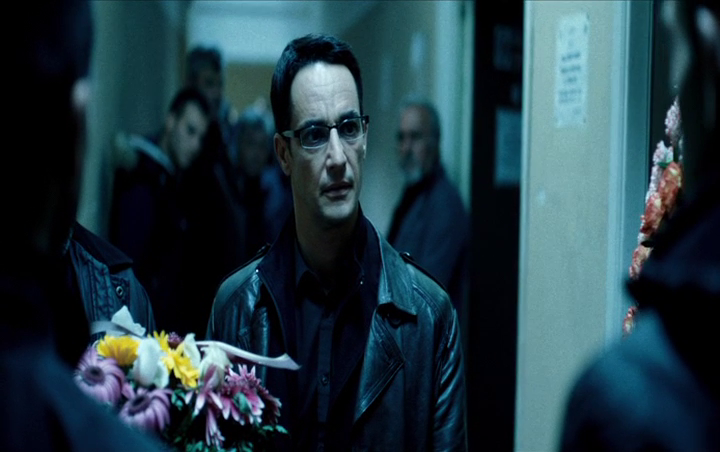 Giuseppe Fumo plays Leo, with a huge, serious bloodhound’s face. Bored with the agricultural life, he leaves his dad’s farm and takes off for Milan to get involved in his uncle’s less wholesome ‘ndràngheta business. Before he leaves, he shoots up the shutters of a bar owned by a local mafia boss who (I think) was involved in killing his grandfather. This unwittingly sets a chain of events in motion which ultimately has dire consequences for his own family, who get dragged back into an old feud where perhaps it would’ve been best to let the dust settle. I got the feeling that these tensions that have been stirred up by Leo were actually revelled in by other members of the gang, simply because modern mafia life is really boring. The most exciting thing these associates get up to in the film’s prologue appears to be stealing some goats for their dinner, hastily stuffing them in their car boot and speeding away from a farm. There are other scenes where goat-herding plays a part, reminiscent of another recent Italian film, Le Quattro Volte. The film alternates between tension and boredom, almost mocking its audience for wanting some sort of quick-fix or burst of violence. Munzi goads us with goats. Fabrizio Ferracane plays Leo’s dad, Luciano, looking like a Jeremy Corbyn-Jose Mourinho hybrid. Starting from a position of reluctance to get involved in his family’s violent business, he slowly gets dragged back towards the fray, leading to some brilliantly tense stand-offs between himself and Leo. As they tussle for the reins to control the narrative of the developing mafia war, Luciano tries to grasp onto a fading notion of parental supremacy, whereas Leo appears to be wielding a more masculine, alpha-male power, which he enjoys lording over his dad. In the world of Black Souls, goats, farming, the beautiful Calabrian countryside – all have some purpose, fit in to the natural order. The human beings in this film really do represent the titular Black Souls – the living dead, serving no purpose other than to finish each other off with their bitter feuds. A ‘don’ from a neighbouring clan makes his way up the mountainside to facilitate some interspecies breeding, bringing a young granddaughter in the hope that she’ll hit it off with Leo. Ancient breeding rituals amongst a dying breed, doomed to extinction. A large portion of the film is devoted to the process of mourning, and the rituals surrounding it. These people are living on the fringe of the land of the dead, devoted to ushering their kind from one world to the next. Marking out the time until it’s their own turn to go. This is an anti-Goodfellas, where the rewards of the lifestyle never yield, as the members of the clan dig their own graves. Nothing to see here. Move along.